Steel bodied couplings for underground mining applications. Available in radially displaceable and shaft mounted designs. These are steel body fluid couplings for underground mining applications. Shaft to shaft connection with flexible coupling at one end. Delay fill chamber is optional. 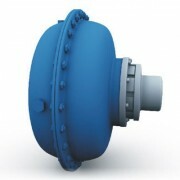 Also available in Radially Displaceable type with metallic disc flexible coupling at both ends. Available with standard Nitrile Seals or Viton seals to meet special oil conditions. Optionally available with Thermal Protection System in addition to Fusible Plug. Available ready to fit couplings bored and keyed for driver and driven end shafts.